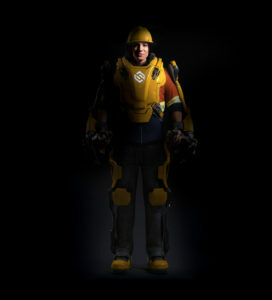 Ben Wolff, CEO of Sarcos® Robotics, the global leader in developing full body powered exoskeletons for work, industry, and logistics announced at WearRAcon18 the formation of the Exoskeleton Technical Advisory Group, X-TAG. X-TAG is an industry focused collaborative effort comprised of executives from companies representing a broad range of industries – Bechtel, BMW, Caterpillar, Delta Air Lines, GE, Schlumberger, Würth Industrie Service GmbH & Co. KG and others. X-TAG promises to be a collaborative effort that bridges the gap between technology and everyday problems. As is with many tech companies, the exoskeleton industry tends to be led by a thirst for pushing the boundaries of wearable technology. Sometimes, this can lead to functional prototypes that do not have a clear application. By forming X-TAG, Sarcos is taking a proactive step in directly involving their potential future clients in construction, oil & gas, automotive, aerospace, manufacturing … in creating a more refined product that is closely aligned to their needs. The need for advisory groups and similar communication efforts was perhaps best described by Jim Key from the United Steelworkers presentation at the January 2017 Exoskeleton Technical Interchange Meeting. About a dozen companies were invited to pitch their wearable and logistics solutions for construction and nuclear waste cleaning, and not even one called in advance to check what challenges needed to be solved. Note that by establishing communications with potential client sites no one is expecting radical design changes to the exoskeleton products. However, there are some design considerations that are important to some applications and not others (snagging, transportability, storage, ruggedness, use length, ability to go under clothing or personal protective equipment, etc…). One simple example given at WearRAcon18 was how would you rate the ability to clean an exoskeleton after “use”? Case 1: two hours a day of use in a temperature controlled car manufacturing line, vs. case 2: eight hours a day in a hot construction site that involves digging and moving a lot of dirt. In case 2, the device manufacturer could be far more successful if a protective sleeve or casing was added to shield the joints and mechanisms (at the cost of some additional weight). As a company, Sarcos has decades of experience with robotics, mainly focusing on animatronics. 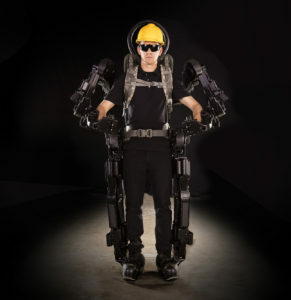 The company also has significant experience with using exoskeletons for teleoperations (the exoskeleton frame is used to receive movement commands from the user in an intuitive control scheme). Sarcos also specializes in full body powered exoskeletons that transfer the loads around the user and directly into the ground. 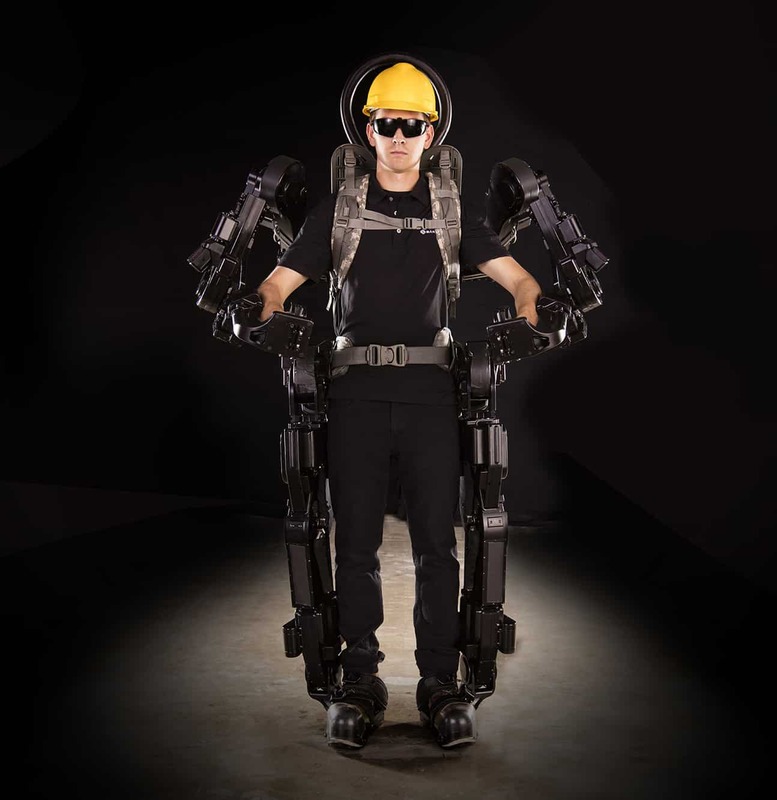 The company aims to build large, powerful, but still agile powered suits that can combine the best of both worlds: human experience and decision making with robotic strength and consistency. With the rise in popularity of smaller exoskeletons and wearable robotics that have few to no powered components is there room for Sarcos? Absolutely, yes. As Ben Wolff highlighted in his presentation at WearRAcon18, smaller and passive exoskeletons are here to stay, but there are some applications for which a powered device will be needed. Current passive shoulder support exoskeletons can provide roughly between 12 to 20 lb of assistive force on each arm depending on the model and setting. While that force can be increased by using larger and more powerful elements, they still won’t transfer the load to the ground. Sarcos aims to build a new generation of powered exoskeletons for work and industry that can support far greater loads while also directing it away from the worker. This could allow workers to complete complicated tasks with heavy parts or machines safer and with reduced fatigue and errors.